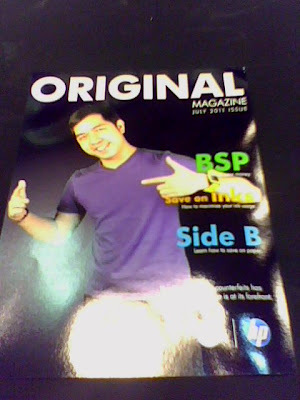 Home Bangko SEntral ng Pilipinas BSP cover guy Coverboy coverpage Genuine Hewlett-Packard HP Magazine magazine cover No to Fake Event Original Original Magazine Trinoma The Magazine Cover! 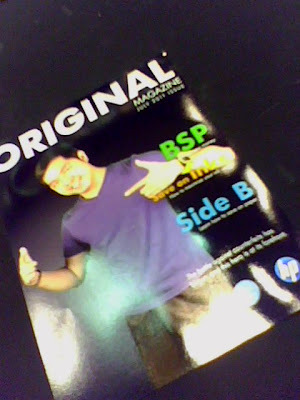 I'm a certified cover boy of different magazines. And this is my latest magazine cover for the month of July 2011! Yeah, this magazine is during the "No To Fakes" campaign of HP (Hewlett Packard) and BSP (Bangko Sentral ng Pilipinas) in Trinoma mall! The said magazine is printed in glossy papers! The cover is too shinny that even lights reflected on it! Actually I tried to shot pictures of it. But I failed to get the best shots since light strikes to it! As you can see even in these pictures, the cover is still shinny!